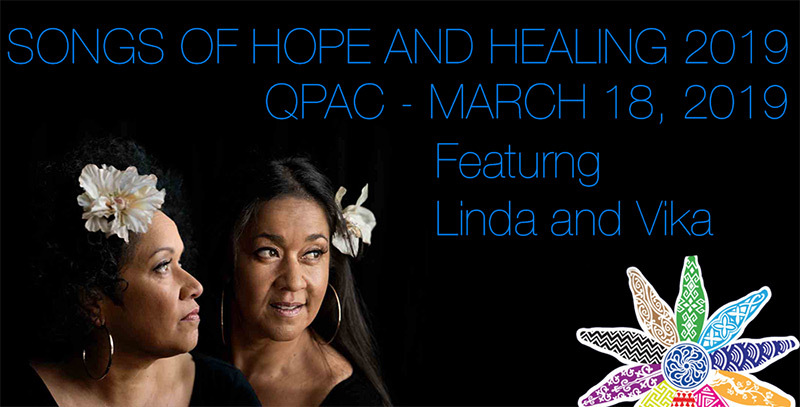 Join Australian music royalty Vika and Linda Bull in Songs of Hope and Healing, on Monday 18 March 2019 in Queensland Performing Arts Centre’s (QPAC) Concert Hall. The dynamic vocal duo will be joined by a cast of over 200 singers and musicians, in an uplifting concert inspired by music, cultures and faiths from around the world. Known for their gospel, soul and blues, the Tongan-Australian sisters, Vika and Linda, are also celebrated for their iconic collaborations with Paul Kelly, The Black Sorrows, Kasey Chambers and Rockwhiz. Vika is also acclaimed for her performance in At Last: The Etta James Story. The exciting line-up of artists in Songs of Hope and Healing also includes QPAC’s newest ensemble in residence JADE New World Collective, gypsy-folk band Mzaza, Songwoman Maroochy, the QPAC Choir, QPAC Youth Choir and Children’s Health Queensland Community Choir, with further artists to be announced. QPAC Chief Executive John Kotzas said that following the successful Songs of Hope and Healing debut in 2015 and concert last year, the centre is pleased to present its third concert and has plans to make it an annual event. “Songs of Hope and Healing is curated to reflect the themes of hope, healing and renewal of the Easter period. In the same vein as our annual Spirit of Christmas concerts which bring the community together to celebrate the festive season and its enduring and powerful messages of peace, love and joy, we hope to make Songs of Hope and Healing an annual Easter season tradition. … “Funds raised from Songs of Hope and Healing will benefit the vital work of Brisbane based Friends of HEAL Foundation (FHEAL), which provides creative arts therapy in schools making a positive difference in the lives of young people of refugee backgrounds…As the state’s leading performing arts centre and a public institution we believe it is important to understand and reflect our cultures and communities. Experiencing and participating in art helps people relate to the world, and learn more about themselves and others,” said Mr Kotzas. Formed in 2012, FHEAL assists and advocates for the important mental health work provided by services such as HEAL (Home of Expressive Arts and Learning), a Brisbane school-based mental health program which specialises in helping aid wellbeing for refugee kids through creative methods. FHEAL’S mission is to provide direct relief from distress and enhance education and cultural integration for refugee adolescents. FHEAL Chairperson, Ms Adele Rice said she is delighted that QPAC will once again present Songs of Hope and Healing bringing together many talented performers of many different ethnicities for a great cause. “The funds raised from this concert will directly benefit our HEAL therapists who carry out brilliant work in five schools across Brisbane with young people who have endured traumatic experiences in their refugee journeys. Through the use of creative arts therapies including Arts Psychotherapy and Music Therapy, we see amazing results in improving the well-being and settlement outcomes for these future young Australian citizens,” said Ms Rice. The Songs of Hope and Healing concerts in 2015 and 2018 collectively raised more than $25,000 for FHEAL. Don’t miss the FHEAL good event of 2019. Songs of Hope and Healing, one night only in QPAC’s Concert Hall on Monday 18 March 2019. To book go to www.qpac.com.au or phone 136 246.